For most the transition from BB10 to Android was a slow and stubborn experience. I was a BB10 hold out until the launch of the KEYone in June of last year, but I still dual carried my Passport until December of last year. For most the fluidity of BB10 meant that you could get serious work done without the need to worry about fancy customizations and themes. The ability to swipe right to get to the Hub and the clutter-free main screen allowing quick and easy access to the camera, phone, search bar and clock was, for me at least, a productivity dream. When I switched to Android, I missed the simplicity that BB10 offered. 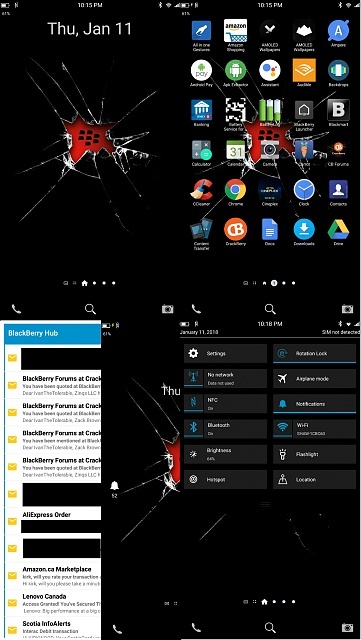 Blackberry launcher provided a lot with its implementation of programmable keyboard shortcuts but lacked any other connection to it’s past. This separation of past and present seems, for the most part, bridged thanks to a new launcher being developed by Zinqs LLC. ZINQS Launcher for Blackberry 10 users has been my daily launcher since it’s initial launch in late December and has only gotten better every single update. The developers have developed mostly Windows applications in the past but were eager to support the Blackberry when reached out to by a forum member. Some of the stand out features that this launcher bundles are keyboard shortcuts, the ability to swipe right to view the Hub (This is currently in beta, and Zinqs informed me that this feature is still being worked on), BB10 style quick settings, phone, search and camera shortcuts and lots more. The current forum thread about the launcher can be found here, and the launcher can be found from the Google Play Store here. The developers are active daily and are always looking for ways to improve the launcher to make it even closer to its BB10 roots. For users coming from a launcher such as Microsoft Launcher or Nova launcher, you may be initially underwhelmed. The settings screen may feel lacking, and the inability to utilize double tap to sleep, or gestures to pull up applications may seem like a huge step backward. 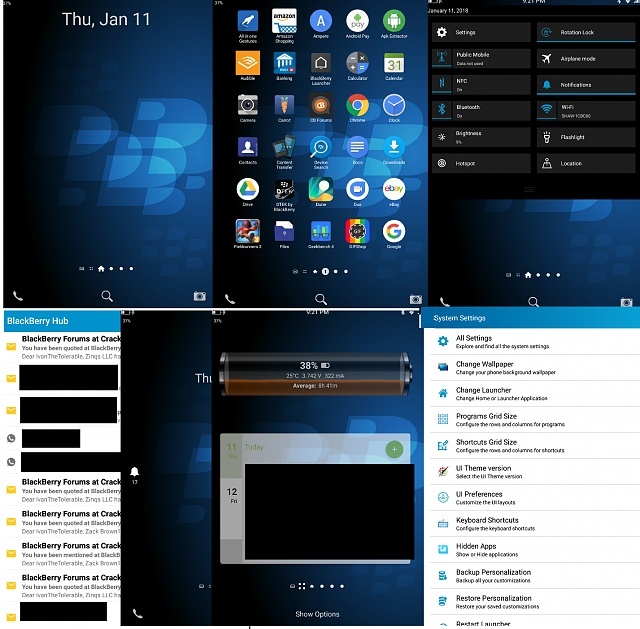 This launcher isn’t built to compete with the feature-packed launchers, but rather to appeal to those who enjoyed the simplicity and appearance of BB10. When you first install the launcher, you will need to give it permissions to use widgets which is used to place the Hub widget within the launcher. 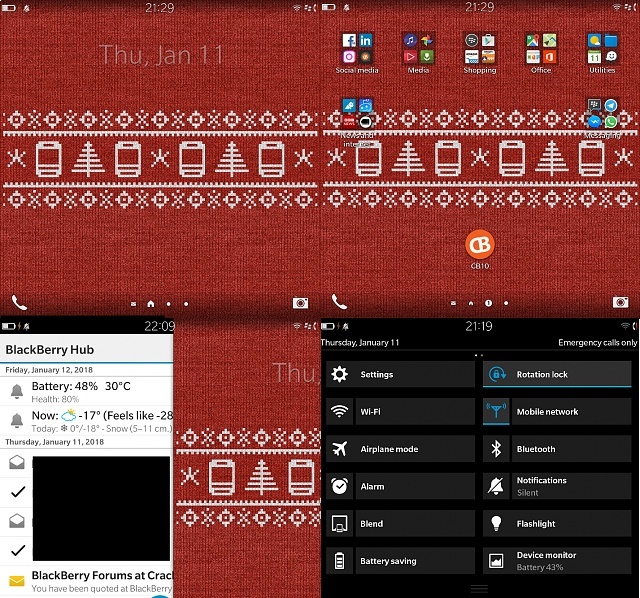 For now, you can enable the secondary widget screen before the Hub, use Blackberry Device Search, and use either the BB10 10.1 or BB10.3 theme. You can change the app layout from 4x4 to 8x8 grid allowing for use on both phones and tablets. Zinqs LLC has managed to create a launcher for BB10 fans within four weeks, and it is better every day. For those who want to use a modern device but is the experience of BB10 then this launcher may be for you. It is still a work in progress, but it is by far the best option for those who wish to relive their Blackberry past. The ability to use Keyboard shortcuts, Swype to the Hub, and a BB10 skin makes this launcher one app that you should keep an eye on. It is available for free from the PlayStore. The first 24 hours allows the user to play around with the launcher, and after that, it is USD 4.99 or USD 3.49 a year. The support thread can be found here. Just make sure you change your wallpaper from the stock one to one of your own. It has been reported that the stock wallpaper can sometimes cause lag in some devices. Let me know what you think of this launcher in the comments. B. Diddy and G_Unit MVP like this. Welcome to Android Central (although you're clearly no newcomer to Mobile Nations )! Thanks for this description/review -- hopefully it'll be useful for former BB users, as well as current Android users looking for a new launcher. As a long time bb10 user and learner on CB I am very surprised that there's a population of Android blackberry users on AC. I didn't even know about these sections of AC until yesterday when I was told this was being pushed here as well as CB. Now I have two sites to waste my work day on! Great review. This launcher is pretty interesting. And the fact that the developer is taking feedback in CB and actively working with the community is amazing. I gladly payed for the app, even when it is still a work in progress, and I don't regret it at all. update: the guys built their own hub! Phone stucks at "powered by android" and restarts again and again.